Get our free report '21 Ways to Make Your Home More Energy Efficient' and start saving today! Save up to 30% on your energy bill for your home or business. 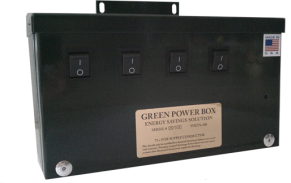 Our Green Power Box optimizes the power that comes into your home, allowing your motors to run cooler and more efficient providing whole house surge protection. Stop spending money you don´t have and take advantage of this technology.